As new patients come to your practice, you can add them to your practice database. If the new patient has an appointment scheduled, he or she already has a patient record with some basic information entered. However, for these new patients with appointments, you can enter additional information, such as a home address, an insurance plan, and a referral source, to complete their records. 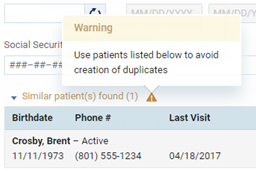 To verify that a patient does not already exist in your practice database, click (or tap) in the Patient Search box; start typing a patient's first name, last name, chart number, or phone number (at least the first four digits); and continue typing as needed to narrow the search results list. If you do not find the patient, click (or tap) the Create New Patient option on the results list. Alternatively, you can click (or tap) Create New Household to add records, at one time, for the patient and members of the same household. These options are available only when what you have typed in the search box narrows the results list enough. Important: If the person appears in the results list with a "New" next to his or her name, this patient already has a patient record. Do not add a patient record for this patient. (Ignore the steps that follow.) This patient's record exists because he or she has a new patient appointment scheduled. However, the record contains only minimal information currently, so you can click (or tap) the patient's name to update his or her record. The Create Patient page opens. Enter the patient's basic information. By default, the First Name field contains what you entered as your search criteria in the Patient Search box, so you may need to change it. 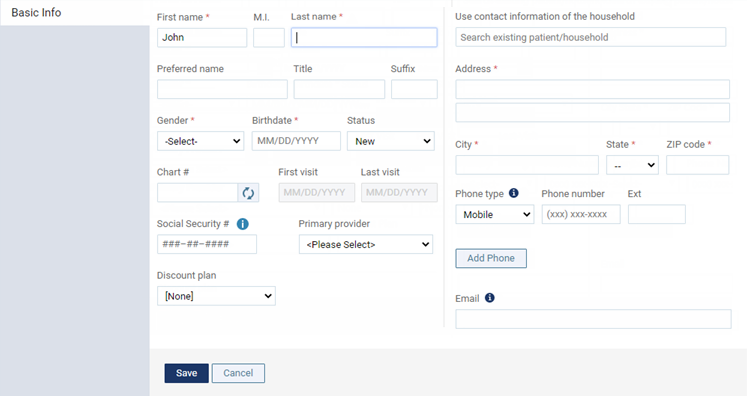 After you enter the patient's first and last name and birth date, if there are any other patients in your database who have the same name and birth date, a list of those possible duplicate patients appears below the other options on the page. 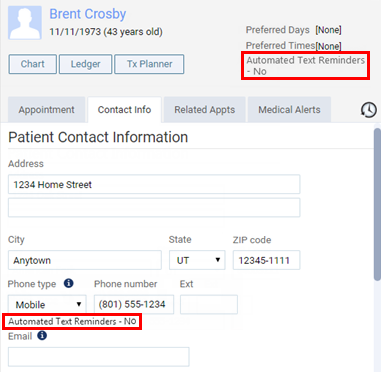 If the patient already has a record, do not continue creating a new patient record; instead, click (or tap) the correct patient in the list to open that patient's record. Status - The patient's status is New by default, but you can select a different status (such as Active or Non-Patient) as needed. 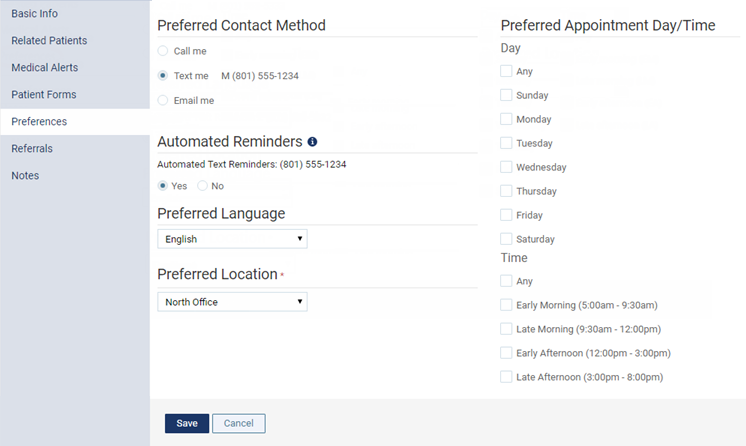 The status changes automatically from New to Active when the status of the patient's first appointment is changed to Complete or when a procedure is posted for the patient. Household - To populate the address and primary phone number for the patient with that of another patient of record. 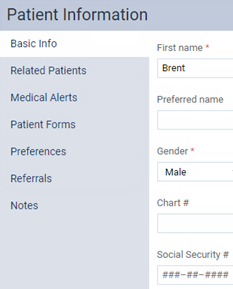 In the Use contact information of the household field, begin typing the name of a patient, continue typing as needed to narrow the results list, and then select the name of the patient who is or has the primary contact that you want to associate with the patient whose record you are adding. All the tabs for entering patient information become available. Why does the patient Address auto populate when I type in the zip code?